When I started designing book covers a couple years ago, I remember looking at designers who were charging over $700 for a print cover and thinking they were charging way too much money. How could they possibly justify such high prices when there were cheaper options? I can make a full print cover in a few hours; why does anyone deserve to earn that much money? Now I’m in a very different position. I’ve kept raising my prices to keep up with the demand. Every time I raise my prices I’m surprised when I get my first few orders – surprised people are willing to spend so much on book cover design. And sometimes I think I’m not worth it – that authors could (and maybe should) buy a cheaper cover elsewhere. But when I look around at other book cover designers charging less money… I can see why people keep coming back to me. Though they have glossy and stylish websites, they only have a few dozen samples and most are boring, average or are heavy on stock photography (I also use stock, but I try not to use those photos I know other people are going to use… or I try to photoshop enough that it won’t be so obvious… still, stock happens). The difference between a mediocre, not bad, pretty good book cover and an amazing piece of art that makes your soul dance, is potentially huge. It’s hard to measure two covers side by side and say why one is better than the other. It’s something you feel. The design just works. The art is moving. The text layout feels clean and well spaced. You can’t see it, but you feel it instinctively. 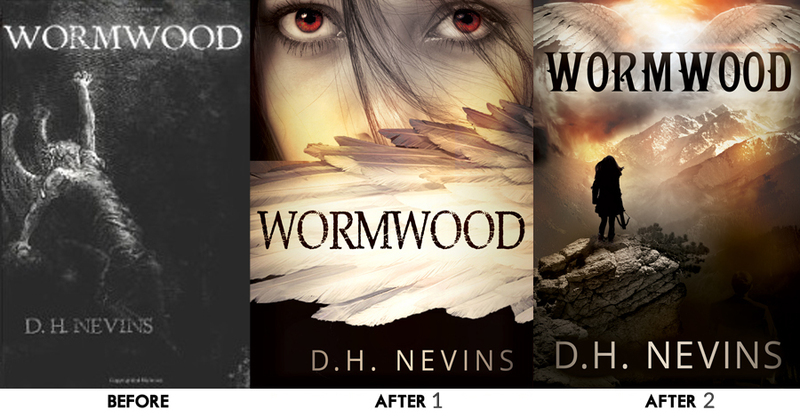 Here’s something I worked on recently – after reading “WormWood” I wanted to help the author by redesigning the cover. 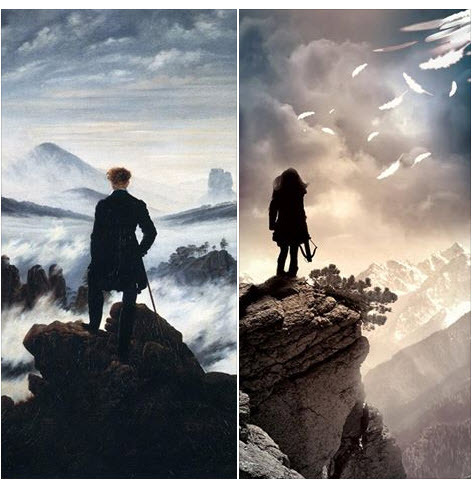 A lot of the story takes place in high places, and I had this painting by Friedrich (1818, “Traveler above a Sea of Clouds”) in mind as I worked on the art. (Mine is the one with the crossbow). I love the art for this cover. I want to print a poster just to put it on my wall. But I made a few options, including this close up. The close up (in the middle) is more powerful and immediate. It does a great job of enticing the right readers who like the genre (paranormal/angel romance), and is simple enough to let them know what the story is about. It would probably sell a ton of books. But the scene with the mountains is more distinctive, more memorable, more touching somehow – there’s so much emotion in that space, so much tension and conflict and longing. Compared to the original (simple black cover, using William Blake’s renders of Paradise Lost) I expect either of the new covers to easily double or triple the author’s sales – we’ll have sales data in a few months. Here are a few things I’ve learned in the last few years. 1. When I charge lower prices, I have a ton of work. I’m stressed and busy. I can’t finish everything. I don’t remember things. I don’t enjoy it so much. As of June 2014, I’m still getting enough work but maybe half of what I got a year ago. I feel more relaxed. I still have a lot to do, and I still have trouble getting everything done and staying organized, but all my clients are happy and the quality of my covers are improving. I have more time to reflect and improvise. If we don’t get things right the first time, I’ll come up with new ideas. 2. The second thing I’ve learned, is that entering a relationship with a client is personal, and long-lasting. I have some clients that took a full year to decide what they wanted. Sometimes, after rejecting all of my samples, they want me to try a lot of other stuff, and sometimes we end up with something better. Other times, in the end I convince them that my earlier samples were the best and will perform the best for their book, and we use what I had made originally. 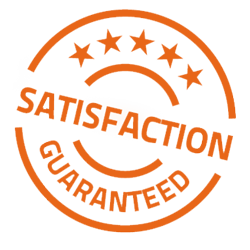 Then they need help with their marketing plan, uploading files, preparing their ebooks and POD formatting, navigating distribution services, editing their sales copy. After the interior is finished we’ll rework the print cover – then there are problems, or the page count changes, or they want to start over and use a different picture. I’m not just describing a few needy clients – this is a pretty typical client/designer relationship for me. Some people tell me I need to say no more often, or charge for revisions, or stop giving away so much free help and advice… but I’m not going to do that. I like helping and I love designing books. My high prices are kind of like a retainer; I become an always available publishing consultant. A cover is really important, and can make a huge difference, but it won’t make a mediocre book successful. If you’ve written a book with no audience, in an unpopular genre, and the book isn’t amazing but just ho-hum, or the writing isn’t great… investing in a cover isn’t a good idea. Fix the writing. Hire and editor. Write another book. The story matters more than the cover, ultimately. If you’re unsure, get a cheap cover, publish the ebook, and advertise enough that you get 100 buys or downloads… then watch the reviews. If you start getting glowing reviews from genuine readers, it’s time to double down and invest more. If you need a cheap, DIY book cover solution, check out www.diybookcovers.com. Right now, there are MS Word templates, but I’m building the WORLD’S BEST online book cover designing software, it’s going to blow you away.